A picturesque rural retreat with delightful views of the surrounding valley in a quiet hamlet. Just 4 miles inland from the coast at Pendower beach and just a 10 to 15 minute drive from the fishing villages of Portloe, Portscatho and St Mawes.Originally the mill of the adjacent mill house, that has been sympathetically converted into a charming character residence. The last flour to be milled was in 1926, with the conversion taking place about 50 years ago. The old mill wheel is no longer in place but its position can easily be traced, as can the old mill leat. The accommodation is accessed via the steps at the front of the property. The kitchen houses a good range of fitted units and work surfaces. Appliances include dishwasher, washer/dryer, fridge/freezer, microwave, hob and electric oven. The purpose built oak dining area has ample seating and a view of the courtyard. The large sitting room is very attractively furnished and has excellent rural views, a feature fireplace in exposed Cornish stone, comfortable sofas, TV, video and a pay phone. On the same floor are two bedrooms. The larger has 3ft twin beds, spacious wardrobe with delightful rare and attractive carvings and en suite bathroom. The smaller bedroom has pine bunks, chest of drawers and a built in wardrobe. These two rooms share a WC accessed from either room by separate lockable doors. There is a family bathroom and wc with electric towel rail and electric shower over the bath down the hall. Lower level: Here there is a spacious family bedroom equipped with a 4ft 6ins double bed and 3ft single. A very attractive pine wardrobe and dressing chest complete this charming room which also has the benefit of a separate nursery. A high chair is provided. A cot can be hired for an additional charge. 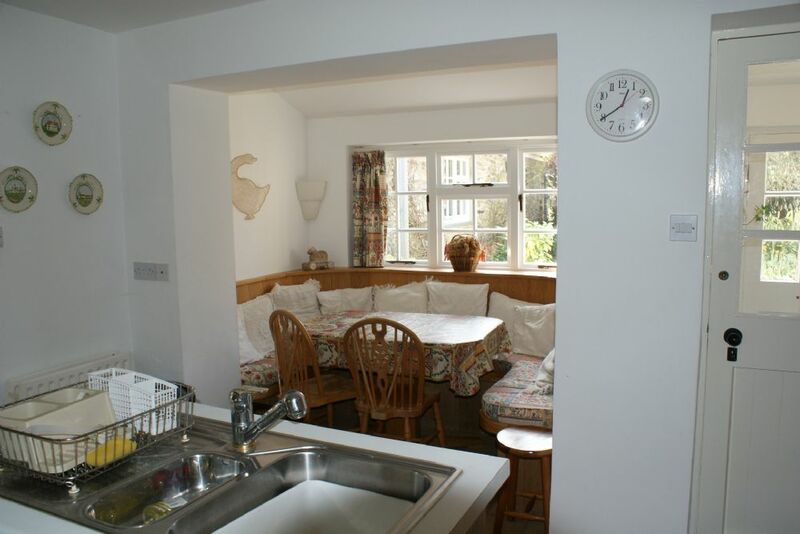 Wi-Fi, which is shared with Ruan Mill Cottage, is available. There is off road parking for 2 cars in the private drive at the front of the Mill. Between the drive and the small bubbling stream there is an area of garden with a picnic table. The main garden, accessed via the courtyard, consists of a sloping lawn with a furnished picnic area. Pets are accepted at a cost of £25 per pet per week. Ruan Mill has the benefit of central heating, and electricity for the heating is paid by a £1 coin meter.